Nokia N86 was first announced in mobile world congress that was conducted on February of this year . It is the first phone from Nokia that is equipped with 8 mega pixel camera with dual LED flash and a variable aperture lens. The phone is reportedly available in some online shops for pre-order and the official date of public release will be announced by July ,this year . 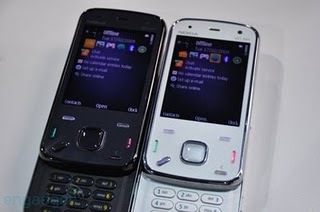 Nokia N86 is based on Symbian OS and with user interface S60 V3 feature pack 2 . It has all other features offered in Nokia Nseries phones falling in upper 350 $ category and with 8GB inbuilt memory that is expandable . 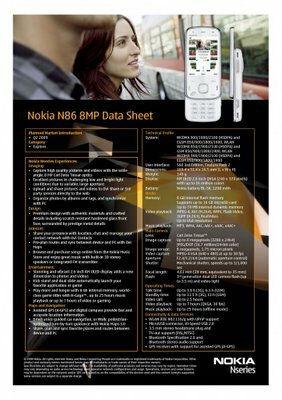 Checkout Nokia N86 features , price and launch date . Nokia N86 has tight integration with Nokia OVI store, just like Nokia N97 . Nokia N97 features S60V5 user interface that has touch functionality and QWERTY keypad , but the camera is only 5 Mega pixels . It is a good choice if you are looking for a phone with more storage and good internet and multimedia facilities . And your pocket should be heavy enough for choosing this option . At the same time if you are looking for a good camera phone with comparatively low price , Nokia N86 would be the ultimate choice . It uses Carl-Zeiss Tessar lens that produce the excellent photographic outputs with available pixels . S60 V3 has thousands of mobile applications already developed . So you don’t need to worry about the number of applications , themes and games you have . Available in glossy black and silver white colors, Nokia N86 price will be in the range of 430- 520$ .